The new Wavedrum costs a fraction of the price of its predecessor and remains a sonic force to be reckoned with. 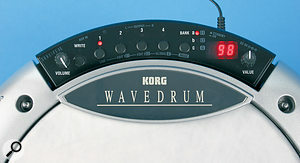 Back in 1994, I attended the Winter NAMM show and witnessed the launch of the original Korg Wavedrum, one of the first synthetic drums to include true physical modelling. It was impossible not to be drawn in by its outrageous sounds and its quirky wooden 'toilet seat' surround. I loved the tonal range, which could be both organic and abstract at the same time, and few could fail to be impressed by the way it responded to subtle playing nuances, just like a real acoustic instrument. What went down less well was the price — about the same as an economy car! A few were sold, and the Wavedrum inevitably appeared on various sample libraries, but what the samples couldn't convey was the way the Wavedrum responded to hitting intensity, head pressure and head damping; the way it behaved like a real drum. Because of its stratospheric price, the Wavedrum faded from view and seemed doomed to be consigned to history. Now, almost 15 years later, it has been reborn with essentially the same sonic capabilities plus a few additional bells and whistles — but without the exotic wood surround. Better yet is the price, which is now closer to that of a mountain bike than a car. If you've never played a Wavedrum, you might still think it rather expensive for what is essentially a single drum pad, albeit with a separate rim sensor that can trigger a second sound, but appearances can be deceptive. 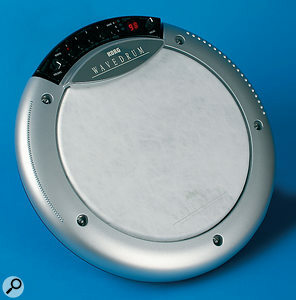 Unlike other drum synths, this one responds naturally to sticks, beaters, hands, fingers and even brushes or head scratching, without having to select a specific brush or stick mode, though you can select between hand and stick sensitivities for the head and rim (independently) per patch, to make the playing dynamics easier to handle. The head is pressure sensitive and there's a separate sensor in the rim, which includes a couple of notched sections that allow you to create cabasa‑like effects when you run a stick along them. 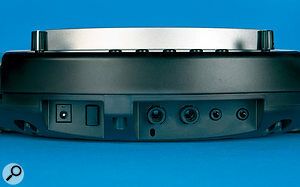 The Wavedrum's rear panel hosts connections for the 9V power supply, quarter-inch left and right outputs, and headphone out and aux in, the last two on 3.5mm sockets.While the main body of the Wavedrum is made from plastic, the rounded upper rim is a robust metal part and surrounds most of the 10‑inch head, other than below the control section at the top. The head itself looks like vellum, but Korg say that it's the same as a Remo fibre skin — indeed, the manual says that it can be replaced with a 10‑inch Remo head. The head can be 'tuned' by means of five tension lugs, to give the required playing feel. Part of the sensor mechanism is housed in the overhanging section below the controls, and it is also possible to strike this part with the hands or fingers during performance to trigger rim sounds. I don't know if this is intentional, but I found it useful. You could play the Wavedrum on your lap, as I did during this review, but there's also a fixing for an optional stand-mount, so you can play it from a standing position. The Wavedrum's sound set varies from realistic‑sounding snares, kicks and toms, via a diverse range of ethnic percussion, to some truly original drum sounds that have a believable ethnic overtone but which do not actually exist in the real world. You can also use it to create completely abstract soundscapes. The synthesis methods include analogue, additive, non‑linear and true physical modelling, depending on the algorithm chosen. You can access drums that jangle or drone, drums that trigger pitch‑changing scales according to head pressure and convincing models of actual ethnic instruments such as tablas, djembe, bamboo percussion and congas. Almost every one of the 100 factory patches inspires you to experiment, but you can also edit patches and save them in 100 user locations. Despite this flexibility, the Wavedrum is both light (around a couple of kilos) and compact. Stereo audio outs on two quarter‑inch jack sockets and a 3.5mm stereo headphone port are included on the rear edge, and you can also plug in an auxilliary sound source (again via a 3.5mm stereo jack), such as an MP3 player, if you want to jam along. There's no MIDI Out, though, as the Wavedrum's head talks directly to the synth engine, without relying on MIDI as an interpreter. Some users are going to complain that they can't record their performances, edit them, then play them back into the Wavedrum, but I suspect the way the head motion translates to the physical modelling process wouldn't be too easy to send and receive over MIDI. While the original Wavedrum generated only synthesized sounds, this MkII version throws in some additional PCM sampled sounds, courtesy of a digital audio engine that runs at a fixed 48kHz sample rate with 24‑bit resolution. In total, there are 36 synthesis algorithms and 200 PCM sounds, the latter split equally between the head and rim sensors and having velocity‑switching capability. The sound engine also includes the capacity to replay on‑board looped rhythmic phrases for jamming along to, and there are built‑in reverb and delay effects, with the option of several different reverb types. The Wavedrum eschews external software editing and can only be controlled by the two knobs and six buttons shown here.The control panel is very uncluttered, with just a Volume knob, a Value knob and six buttons, one of which is a dedicated Write button. The middle four buttons, which have status LEDs above them, are numbered one to four but also have secondary functions as Live, Edit 1, Edit 2 and Global buttons, the last being used to adjust overall settings such as those for the pressure sensor under the head, and also to set thresholds below which the head and rim won't trigger sounds. Oddly, the loop playback and selection is also hidden away in the Global menu: two of the number buttons are used to start or stop the loop and, in combination with the Value dial, to select which loop plays back. The Bank section has three status LEDs to show which bank of Live sounds is selected. Any of the user or factory patches can be chosen to populate the 12 Live slots, so as to enable quick changes between relevant patches during live performance. Pressing the Bank button repeatedly steps through the three banks and also doubles as a Mode selector or shift button for accessing the edit modes. Using Bank as a shift key and pressing the Edit 2 button allows you to change algorithms, pan settings, and aspects like tuning and the response curve. Bank/Edit 1 then accesses parameters exclusive to that algorithm, and keys one to four and the Value knob can be used to select and adjust them. You really need to have the manual on your knee when editing, otherwise you won't know what the algorithms do or what their editable parameters are, as each one has different controls. A USB socket and a computer editor would have been nice, but clearly that wasn't included at the planning stage. All patch numbers and edit data are displayed by the three‑character, seven‑segment LED. Power comes from one of those immensely irritating consumer‑style external power adaptors, but there is at least a moulded recess under the unit with a protruding prong, around which the cable can be routed to reduce the risk of accidental disconnection. Separate head and rim pickups are used to 'excite' the modelled drum sounds and to trigger the PCM sounds. In conjunction with the pressure sensor under the head, hand gestures may be used to bend or damp notes, as well as to create sounds by rubbing, scratching or brushing the head. Some of the algorithms allow you to combine a specific DSP method and a PCM instrument to be played from the head, with a different combination assigned to the rim, which can result in some very versatile sound sets that vary dramatically with playing style and intensity. Hit the rim quietly and you may hear a tambourine, while hitting it harder might produce thunder! All the conventional drum-kit sounds can be synthesized, from incredibly responsive snares to kicks and toms of all sizes. The ethnic section evokes the sound of congas, tablas, clay udu drums, bells and bowls, to name just a few examples. The sound set encompasses the world of percussion from Africa and India to Asia and South America, but the PCM side of the instrument means you can also add in sounds such as sitars, drones, pitched tones and rain sticks. Once you've explored the 100 factory patches and got into editing, you'll find that you can change obvious parameters such as pitch, decay time, loudness, reverb and delay, but you can also modify the sensitivity curve of the pressure sensor, or even change the head-material parameter so that it behaves like metal rather than skin. The actual parameters that can be adjusted vary depending on the algorithm selected, and, as pointed out earlier, you really need the manual to hand to make sense of these. For the serious player, what's been described so far is probably already enough to seal the deal, but if you're still working on your rhythmic chops, there are those 100 looped rhythmic patterns that you can play along to. I guess the need to keep the control panel compact is why some of the editing can be a bit on the cryptic side, but it's not a complex process, as long as you have the relevant manual pages to hand. In fact, it's probably worth copying the parameter and algorithm pages and laminating them! However, it will probably be some time before you exhaust the possibilities of the factory presets, because they take on a different character depending on how you play them. For studio work, the fact that you only have one Wavedrum is less of an issue, as you can overdub multiple parts if need be. If you feel the need to quantise your performance, sounds can always be sampled once you've created them. The more conventional drum sounds are a real pleasure to play, because tricks like damping or pressing the head to change the pitch work in a fairly natural way, as does playing rim shots. On some patches, velocity switching means you get a quite different sound when hitting hard, and once you drift into the more abstract patch areas, you'll find yourself creating soundtracks to imaginary movie sequences using nothing more than the Wavedrum. Some of the drum sounds have a lovely depth to them, while others rattle, shimmer or warble. All make you want to keep playing, and despite the technology being over 15 years old, the sounds are as fresh and relevant now as they ever were. So is the new Wavedrum perfect? Of course not; nothing ever is. Other than the consumer-style power supply I've complained about, there is a time lag of two or three seconds when you change some of the patches or loops, although having the 12 quick access patches available, using the bank and number buttons, should keep you out of trouble in live performance. Some users will also be miffed by the lack of MIDI In and Out, the lack of a computer editor and the inability to import your own PCM sounds, but these minor limitations are overshadowed by the sheer playability and sonic scope of the thing. If you have even a hint of rhythm in you, you'll probably find yourself having to be forcibly parted from the Wavedrum once you get hold of it. I've never come across a drum synthesizer that responds as well as this, but if you need more sounds at the same time and can live with less dynamic subtlety, the Roland HPD-series instruments are worth looking at. Much more affordable than the original. Wide range of traditional, ethnic and abstract factory sounds to get you started. Navigating the Edit menus is difficult without the manual on hand to tell you what the parameters are. Some will still find the price too high to justify for a single drum. The original Wavedrum became a cult product that many heard but few got a chance to play. This new model may not have the fancy woodwork but it actually does more than the MkI, while costing much less. Korg USA +1 631 390 6500.